(TibetanReview.net, Jan24’19) – Contrary to previous Indian media reports which cited government officials as saying he had not responded to offers to grant him visa, the Karmapa has said he has continued to remain in contact with New Delhi and was still waiting for a response to his application. 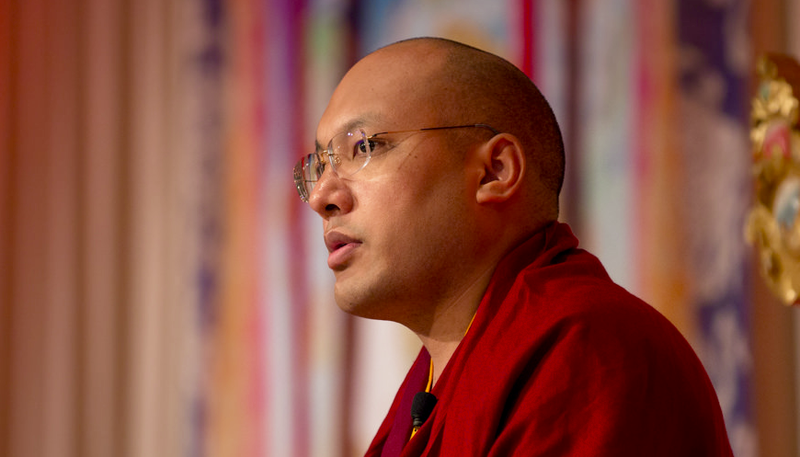 In a wide ranging video message at the end of the annual Kagyu Monlam prayer festival at Bodh Gaya, Bihar, the 17th Karmapa Ogyen Trinley Dorje has said he applied for visa on his newly acquired Commonwealth of Dominica passport and sought to surrender his government-of-India-issued Identity Certificate (IC) for this purpose. However, the Indian mission in the USA expressed inability to accept the surrender of this travel document without consulting New Delhi. IC is issued to Tibetan residents by the government of India for overseas travel and has only limited international acceptability. The Karmapa has said this situation put paid to his plan to make a short visit to India in Oct 2018 to firstly meet with His Holiness the Dalai Lama after a long time and to hopefully meet with some concerned Indian government officials to discuss certain matters. He has also spoken of his resolve to attend the meeting of the top Tibetan religious leader which was scheduled to be held at Dharamshala in Nov 2018. The meeting, being organized by the Central Tibetan Administration, was later put off indefinitely due to the passing away in Nepal of the head of the Nyingma tradition of Tibetan Buddhism in a freak accident. However, as the matter dragged on and he was not in the best of health, the Karmapa has said he decided to take it easy, get a medical checkup, and go into a retreat. The Karmapa has also spoken of his disappointment at not being able to attend this year’s Kagyu Monlam at Bodh Gaya, noting that he has been able to attend only two of them so far. The Karmapa is probably the third most influential Tibetan religious leader and has considerable following across world. And with China using Tibetan Buddhism for gaining soft power influence across Asia, India has been more accommodating of him in recent years, party also because of strong support he enjoys among the Buddhists and the top leaders of the sensitive border state of Sikkim who have been pleading his case with New Delhi. His movement was otherwise tightly controlled since his arrival in the country in Jan 2000 after escape from Chinese ruled Tibet. This was because a section of the India intelligence entertained doubts about the authenticity of his escape and the Karmapa has said he was denied opportunities of meeting with senior government officials to clarify matters.